← Where the F— are My Girl Scout Cookies? So the Super Bowl was this weekend! It was in New JERSEY and was actually super BORING! I mean, not only did Peyton and his non-bucking Broncos get beat by BIRDS 43-8, the commercials were BLAH! I was all, I gave up watching Downton Abbey for this? Whaaaa? 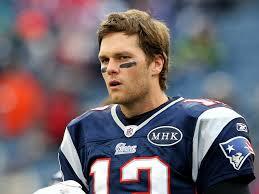 Tom Brady is hotter. Just saying. Because I am committed to serving the people, I am going to show some commercials that are actually GREAT. I’m a real humanitarian, I am. So without further ado, I present to you Liz Simons’ favorite commercials in the world, which also mean they are the best in the world because I have the most exquisite taste in the world. So . . . can someone please tell me where I can get a pizza with nothing? Oh yes, this commercial for Polly-O Sting Cheese can! After such a magnifique dinner, I need some dessert. How about a nice piece of Storck Chocolate Riesen? If fruit is more of your thing, how about a Bonkers? Or perhaps a breath mint? But WHATEVER you do, stay away from drugs! So what are your favorite commercials??? This entry was posted in Great Television and tagged Bonkers, Commercials, Drugs, Mentos, Peyton Manning, Polly-O String Cheese, Super Bowl. Bookmark the permalink.